Oil prices inched down Tuesday in Asia as market participants eyed the midweek release of U.S. government data expected to show domestic refinery utilization rose for the sixth straight week. Light, sweet crude for September delivery lost 15 cents to US$76.68 a barrel in electronic trading on the New York Mercantile Exchange, midmorning in Singapore. The contract lost 19 cents to settle at US$76.83 a barrel Monday. It rose more than US$2 Friday to US$77.02, a cent shy of the July 2006 record close for a front-month contract. The contract hit an 11-month intraday high of US$77.33 Monday in a short-lived rally analysts said was fueled by technical buying. U.S. Energy Information Administration data due Wednesday is expected to show U.S. refinery utilization increased last week, with an accompanying rise in petroleum product inventories and a decline in crude stocks, according to a Dow Jones Newswires survey of energy analysts. Refinery runs are expected to have risen an average of 0.7 percentage points to 92.4 percent of operating capacity. 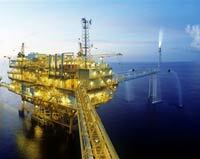 Analysts expect crude oil stocks to have fallen 690,000 barrels with the increased refinery use. Meanwhile, gasoline stocks are expected to have increased 1.1 million barrels, and distillate stocks, which include heating oil and diesel fuel, are predicted to have risen 1.4 million barrels. Investors are also closely watching OPEC, whose officials have been giving mixed signals about whether the cartel will decide during a September meeting to boost production. Some Organization of Petroleum Exporting Countries officials have recently suggested oil is priced too high, and others have stated that there is no reason to boost production. OPEC Secretary General Abdalla Salem el-Badri said the group would be uncomfortable if oil prices rose above US$80 a barrel or fell below US$50. OPEC would move to alleviate any supply concerns if it saw hard evidence, he said. "There is no official price band, but I think I can safely say we would not feel comfortable if the oil price sank to US$50 a barrel," el-Badri said in an interview with Austrian financial daily Wirtschaftsblatt published Monday. "A price above US$80 also wouldn't make us particularly pleased." September Brent crude lost 18 cents to US$75.56 a barrel on the ICE futures exchange in London. Nymex gasoline prices were flat at US$2.0856 a gallon (3.8 liters), and heating oil futures rose 0.74 cent to US$2.0725 a gallon. Natural gas futures gained 9.6 cents to US$6.595 per 1,000 cubic feet.